Eclipse positions for 21st August 2017, Washington – a comparison with Solar Fire. 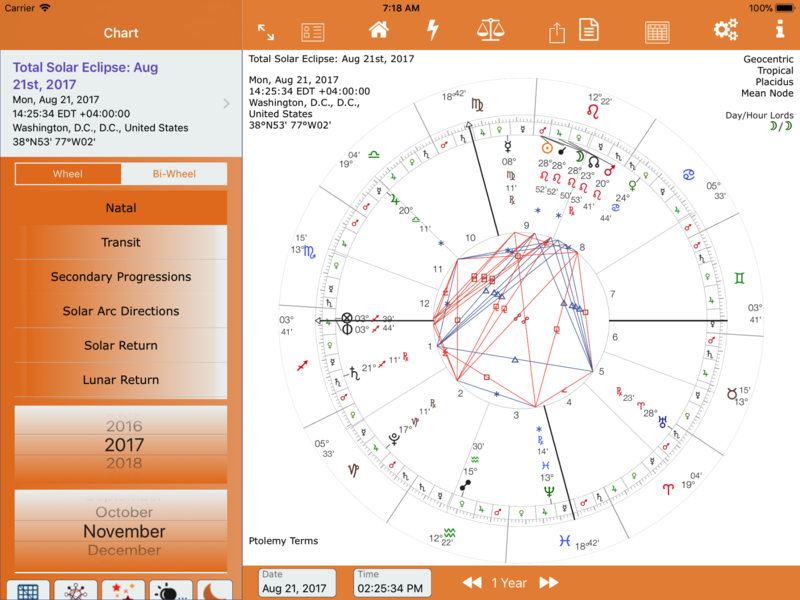 Creating a Lunar Eclipse Chart – shows creating a new Eclipse Chart on an iPad Air 2 simulator on a Mac. It shows a mouse – on actual iPad you would tap. 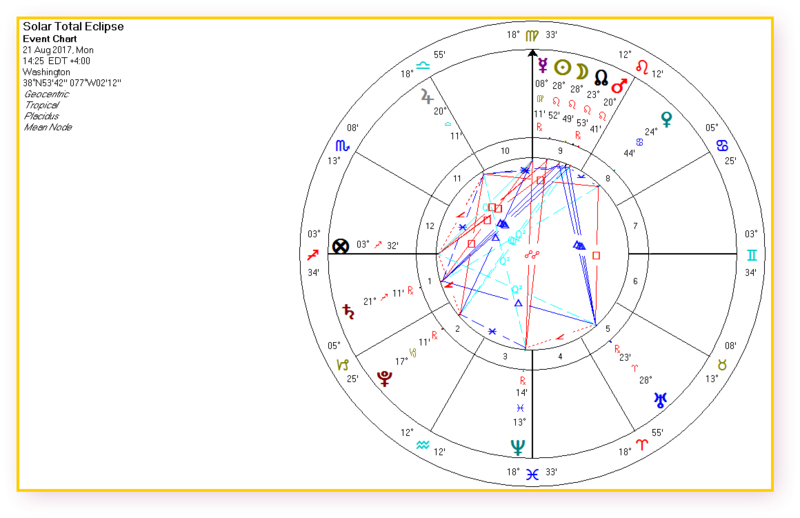 TL;DR Ensure the loaded chart Year is the Year of the eclipse you want to save. 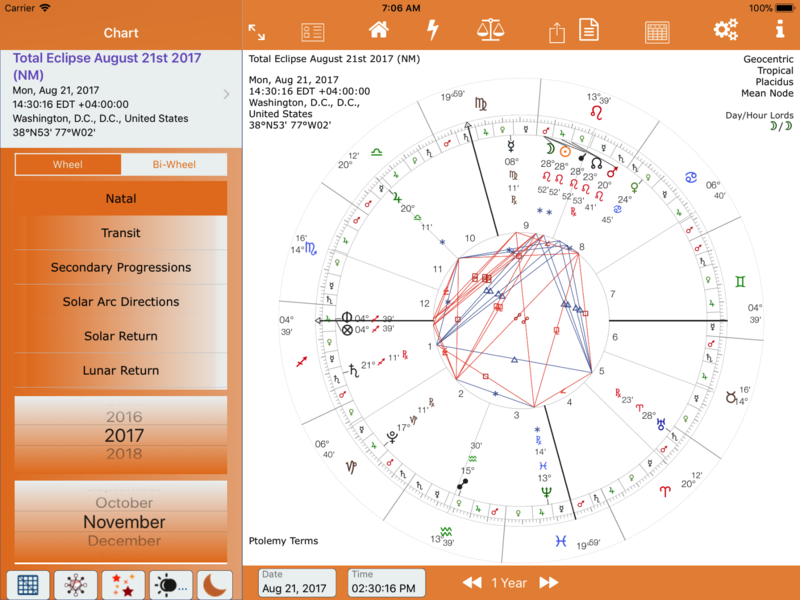 When you tap on New Chart and tap on the Eclipse icon the eclipses shown relate to the date of the chart. To see eclipses at a preferred date range tap on Secondary Progressed, or Transit which will take you to a now date. Adjust the date to the approx time you wish to save the eclipse. 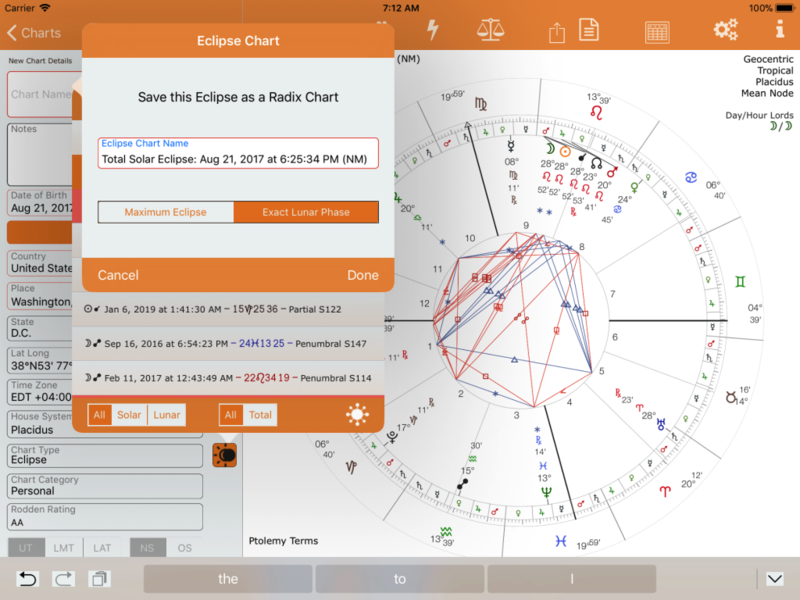 Now tap on New Chart and tap on the Eclipse icon. This will give you your preferred eclipse date range related to the date of the chart. 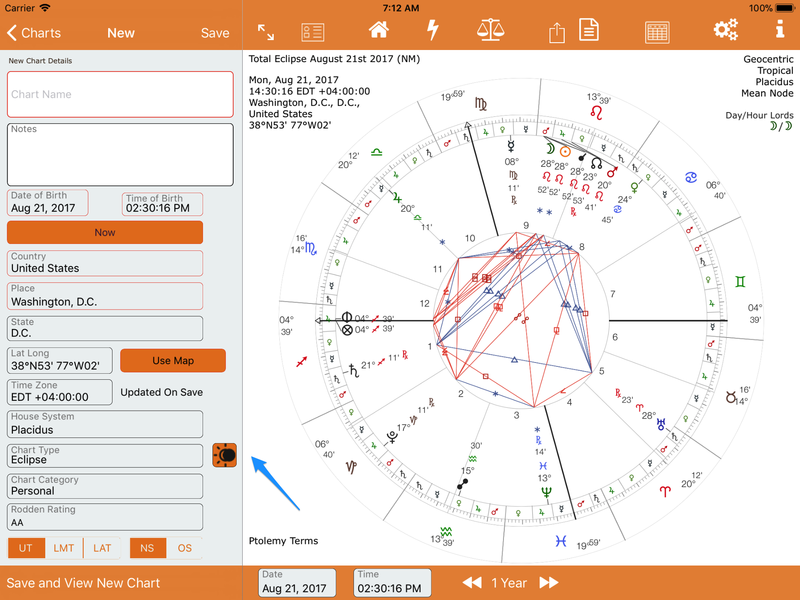 If Exact Lunar Phase is selected the chart name has either NM or FM appended to the chart name – note that this field is editable. NM = New Moon (Solar Eclipse). Note all times are UT in the Eclipse Table. 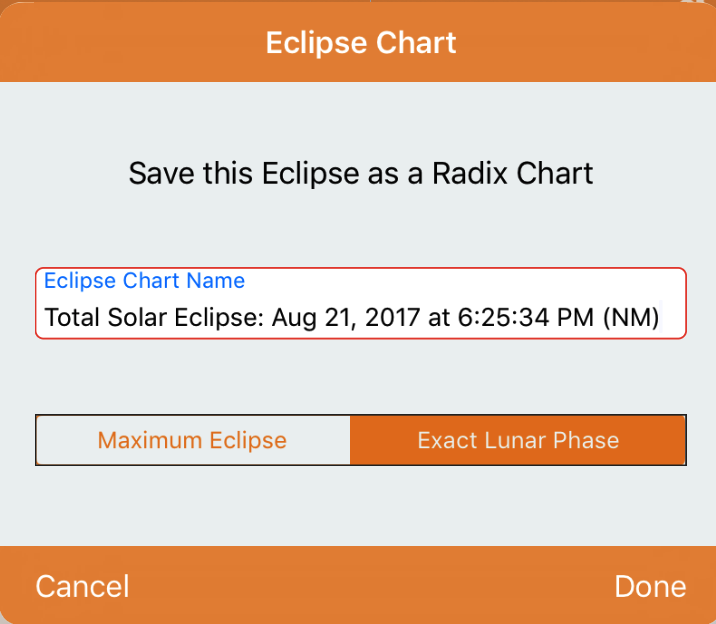 All Eclipse times are converted to local time when saving as an Eclipse Chart. The eclipse glyph (Solar and Lunar) will always show the maximum eclipse time/degree and minute. Note also that appulse is the same as penumbral. 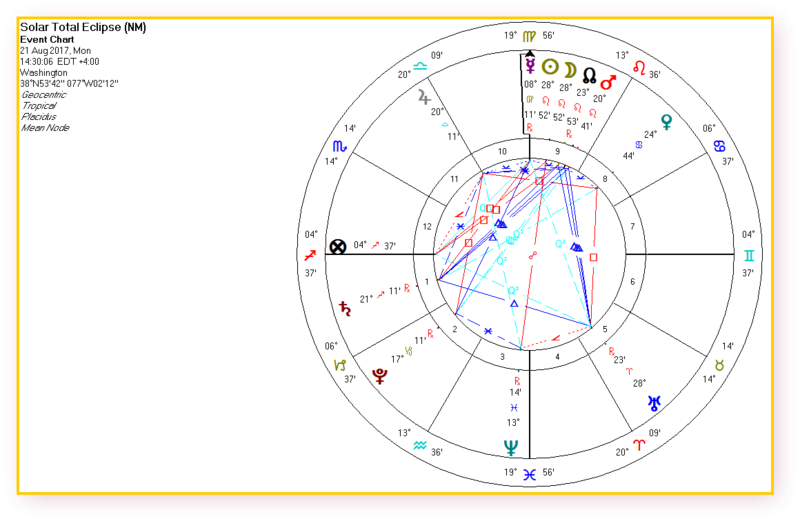 The difference between these two eclipse types (Maximum and Lunar phase) is not usually more than 15 minutes. 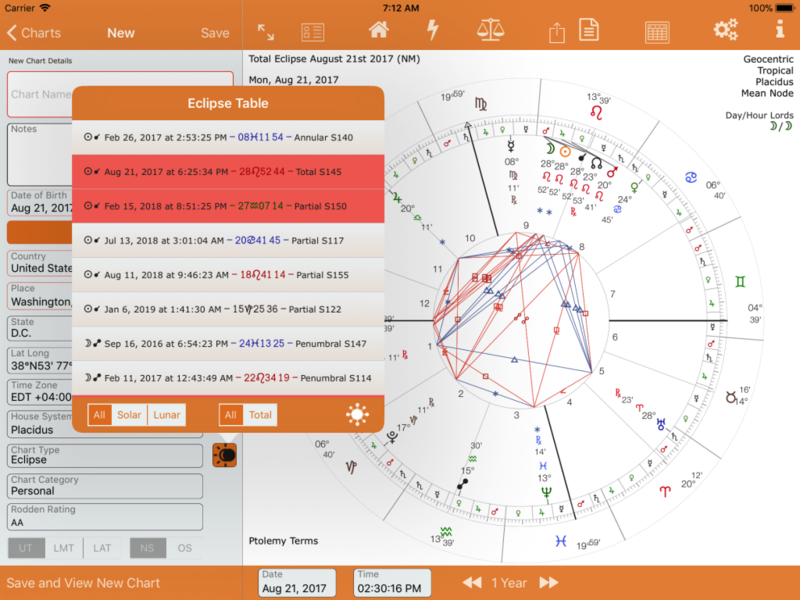 Eclipse charts are classed as Natal/Radix charts by AC for the purposes of filtering and display, although their Chart Type is “Eclipse”.